Posted November 4, 2015 by Jackie McMillan & filed under Bar, Bar Food, Booze, Cocktails, Eat & Drink, Pub Bistro. 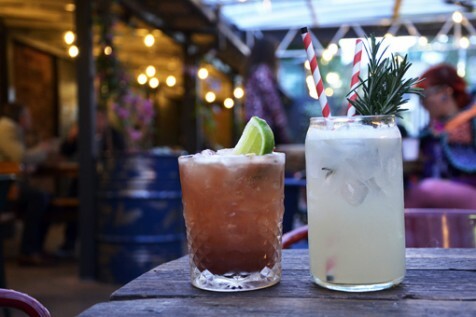 The Newington on Stanmore Road has been given a new lease of life; getting a fresh lick of paint and recently being re-launched as Public House Petersham – a funky space where the focus is on the community. The traditional pub decor has been ditched and replaced with cool street artworks, pinball machines, a woodfire pizza oven and a shipping container beer garden. Perfect for sharing on a warm day is the strange but summery Local Haloumi ($24) – a vibrant salad of haloumi, grilled Hawkesbury squid and watermelon. Feeling daring, I ditched sliders for the Steak Tartare ($22) this week. “It’s basically a deconstructed burger,” my date offered. A stolen sip of her New Port Sour ($16) – whisky, lemon, sugar and cinnamon bitters – quickly returned my tastebuds to normal. While I love my whisky, I found my summer spirit drink in the Hard Lemonade ($16) – gin, elderflower liqueur, lemon, thyme and in-house lemonade. Yum.